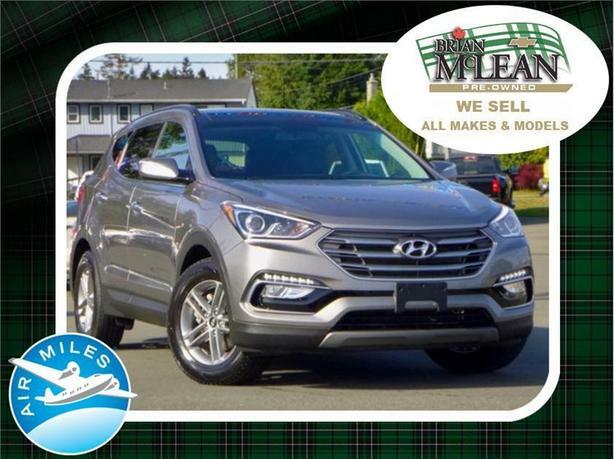 ***Was $31995, Accident Free, BC SUV*** Our 2018 Hyundai Santa Fe is a sport utility vehicle equipped in Sport trim. Our Santa Fes exterior features tasteful chrome touches and 17 alloy wheels. Powering all wheels is Hyundais 2.4 liter Theta II four cylinder. Featuring direct fuel injection, it produces 190 horsepower and 181 ft. lbs of torque. Inside, we find a luxurious leather interior that comfortably seats five. All seating is heated in either two or three stages, and the drivers seat is fully powered. Overhead is a panoramic glass sunroof with a power retractable sunshade. The leather wrapped steering wheel features controls for audio, cruise, the driver information center as well as hands free calling and voice commands. Climate control is in dual zones and features a digital interface. The center infotainment system features auxiliary and USB connectivity, as well as Bluetooth audio and phone pairing. In the back, we find a spacious cargo area with under floor storage that is accessed through a remote controlled rear hatch. Other features include blind spot detection, parking sensors and downhill descent control. The 2018 Hyundai Santa Fe earned the IIHSs 2018 Top Safety Pick+, and earned the highest possible rating in five of six crashworthiness tests. ***This vehicle qualifies for our Certified Pre-Owned Program. It includes a 150+ point inspection, a 3 month/5,000km warranty or the balance of the manufacturers warranty, a one-time 30-day or 2,500km exchange privilege, and 24-hour Roadside Assistance. This Program includes all makes and models, it is the #1 Pre-Owned Vehicle Program in Canada*** For Sale at our Brian McLean Chevrolet Buick GMC store located in Courtenay, BC. Please contact us for finance/purchase options and further details. Trade-ins welcome. ** Serving communities on Vancouver Island for over 31 years, Nanaimo, Parksville, Qualicum, Duncan, Victoria and many customers on the mainland in Vancouver and as far as Kelowna. Ask about our travel assistance for out of town buyers!! !